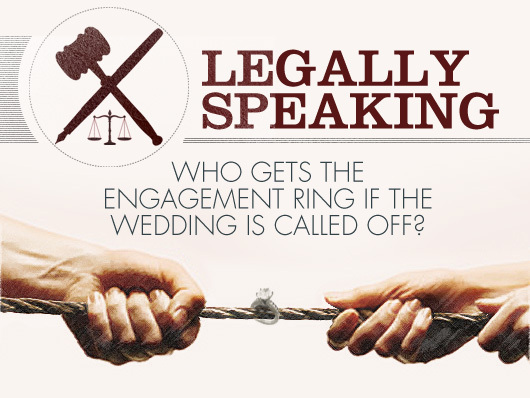 LEGAL RIGHTS: TRINIDAD AND TOBAGO: Broken engagement: who keeps the ring? Q: My boyfriend proposed, gave me a ring and then cheated on me 2 months later. I dumped him and now he wants the ring back. What does the law say about this? N.B. : In order to reflect modern day society where a woman would sometimes propose to a man, the following terms have been altered for this article. In other words, the engagement ring is a gift and the ring-receiver is not obliged to return it. Modified rule - the ring-giver can demand the return of the ring unless s/he breaks the engagement. Strict rule - the ring-giver is entitled to the return unless his/her actions caused the breakup of the relationship, the same as the traditional approach. There is also a third instance called the no-fault rule, whereby the ring must always be returned regardless of the circumstances. The ring only becomes the property of the woman when marriage occurs. Many courts look at an engagement ring as a conditional gift that is given in contemplation of marriage. If there is no marriage, then the engagement ring needs to be returned. The courts also have held in these states that the reasoning for no-fault divorces holds for no-fault broken engagements so an engagement ring should always be returned regardless of who decided to call off the engagement. In these locales, an engagement ring is considered to be an implied conditional gift and if the guy breaks the engagement, he won't get the ring back. If he doesn't break the engagement, he can request its return. Bottom line: If you get dumped, you get to keep the ring in these states. Other courts have held the belief that an engagement ring is an unconditional gift and so it doesn't need to be given back. If there is no marriage, then the engagement rings engagement ring needs to be returned. If he cheated on you, why would you want to keep the ring anyway? Anyhow, I would say that whatever the circumstances surrounding the broken engagement, the ring should generally be returned unless the ring giver indicates otherwise. An engagement ring indicates intent to be wed thus, if you don't get married, it should definitely be returned.